Spices! 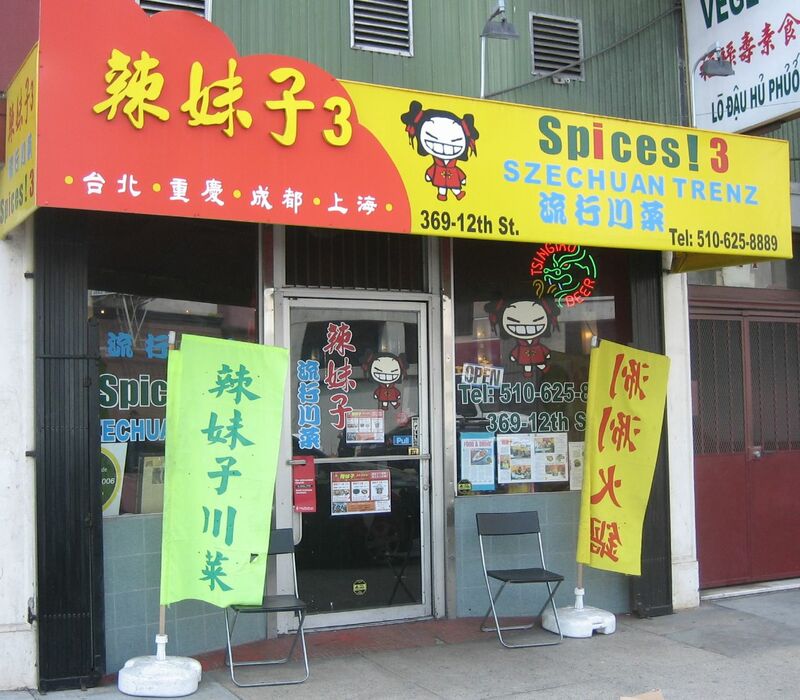 Szechuan Trenz has two restaurants in SF a third in Oakland, and I hear there is a fourth on the way. We enjoyed lunch at Spices!3 in Oakland on a weekday when the restaurant was not too busy. 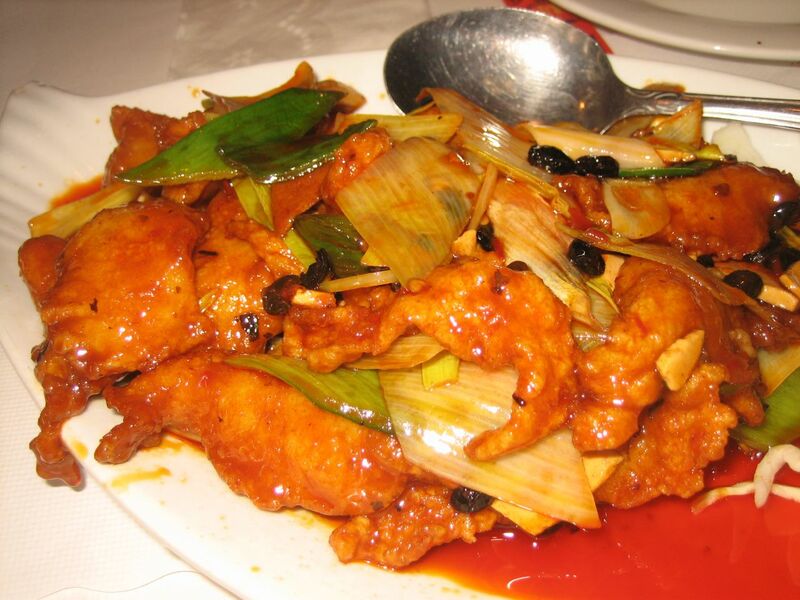 Dishes are rated on spiciness from zero to three stars. I am a lover of spicy foods, so I was delighted by the sound of items like "mind numbing spicy beef tendon" and "fish with explosive chili pepper." My lunch partner suggested we go easy, so I settled for the twice cooked crispy fish fillet -- a two star punch. 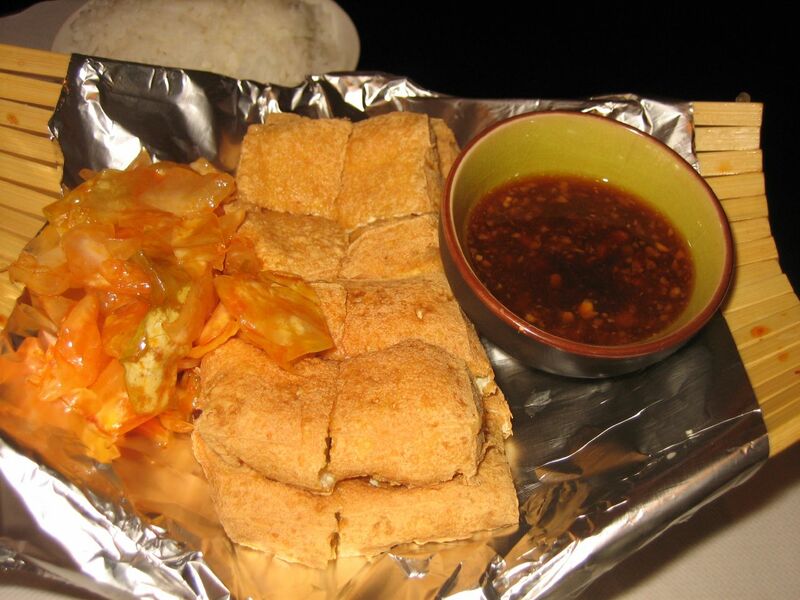 We started with the plain stinky tofu because it had been a long while since I'd had the dish and I could not remember if I liked it or not. He ordered the dry braised pork intestines and the house brought us two bowls of hot and sour soup. A good bowl of hot and sour soup is something that I like, and rarely come across. This was no exception. The complimentary soup had no flavor. No hot, just sour and thick with too much corn starch. The stinky tofu was crispy on the outside and had good texture. I'm sure this was a good representation of this Taiwanese dish. After eating about four pieces, I confirmed that I do not like stinky tofu. The meal was not off to a very good start, luckily the conversation and both of the entrees were good. The twice cooked crispy fish was a lightly breaded and fried fish fillets with a spicy sauce coating everything. The sauce was spicy, but still allowed the flavor of the moist fish to come through. I'd definitely order this again. 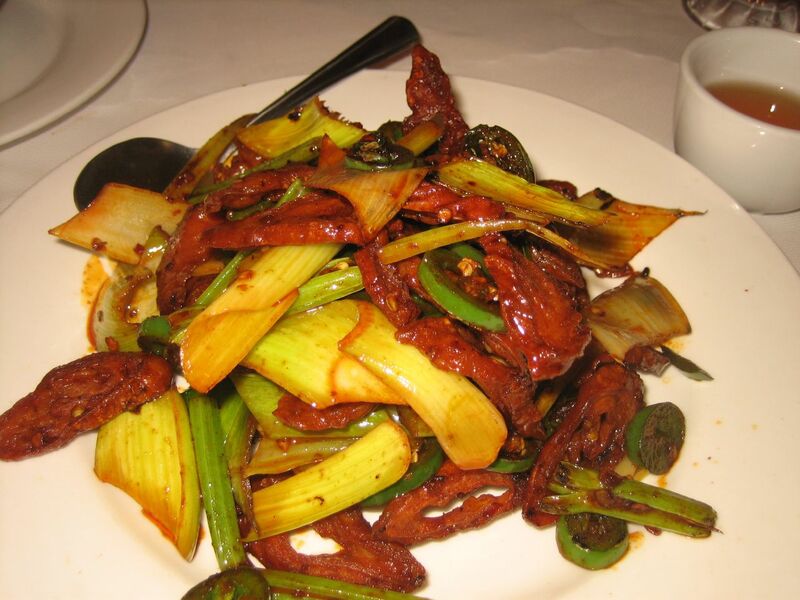 The Dry Braised Pork Intestines were spicier than the fish, slightly crispy from frying and accompanied by celery and jalapenos. The heat from the jalapenos somewhat overpowered the dish, but the pork was satisfyingly salty and spicy. The spice level was extremely high by local standards. Even with the two star spiciness, I felt that any additional heat factor would cover up the other elements of the dish. Overall, I enjoyed the food, though it lacked the depth of spiciness that I'd tasted in Szechuan where the spiciness was high, but came in layers and waves of smoke, pepper, salt, and heat. 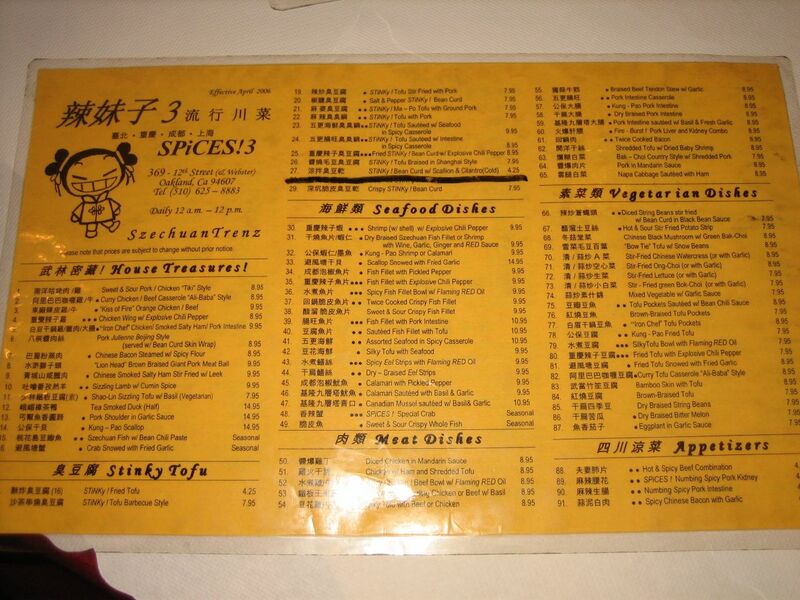 Still, the menu at Spices! is so extensive and humorous ("Gangsta casserole murder style") that I'll have to return to try at least one of the "numbing spicy" dishes. you should try the lamb hotpot, i believe it's called "gangster style." spicy and soooo tasty! I love lamb! Thanks for the tip, I'll check it out.